The MOOC space essentially doubled this year. More people signed up for MOOCs in 2015 than they did in the first three years of the “modern” MOOC movement (which started in late 2011—when the first Stanford MOOCs took off). According to data collected by Class Central, the total number of students who signed up for at least one course has crossed 35 million—up from an estimated 16-18 million last year. Coursera, the largest online course provider in the world (MOOC or otherwise), added 7 million new students to its userbase (and so it now has 17 million students in total). This is the first time that the MOOC market has grown faster than Coursera. Last year, Coursera was bigger than all other MOOC providers combined, but in 2015 it accounts for slightly less than 50% of all MOOC students. Coursera, edX, and Udacity are normally known as the big three. FutureLearn, which closed 2015 on a high, had a breakout year, and it now has more students than Udacity; this makes FutureLearn the third largest MOOC provider in the world now. They grew 275% in 2015 and are rapidly approaching the three million user mark. Along the way, they also launched what would be the world’s largest single session of a MOOC: 440,000 students signed up for one session of the Understanding IELTS: Techniques for English Language Tests course, which was taught by the British Council. Compared to last year, the growth rate for courses has slightly slowed down from 100% to 75%. Around 1,800 new courses were announced in 2015, taking the total number of courses announced since the inception of MOOCs to 4,200. Originally, MOOCs started out as college classes that had been put online, but now course creators are adapting their courses to better fit students’ schedules. This means that semester-long courses are being broken down into smaller courses. 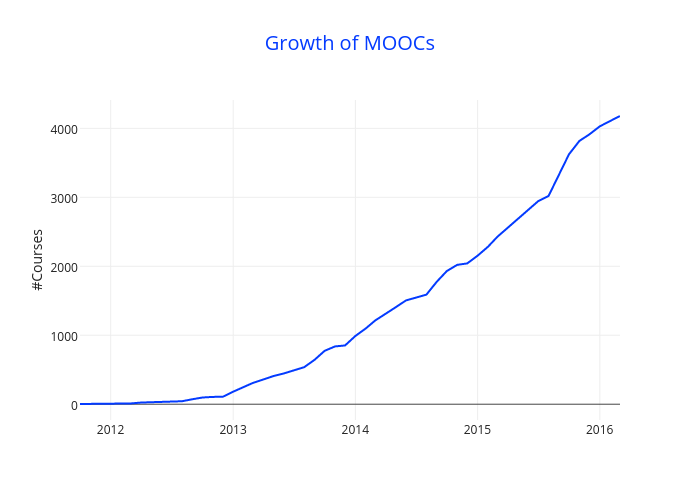 This makes it difficult to capture the growth of the MOOC space in a total number of courses. There are some courses that can be finished within a couple of hours. In September 2013, edX was the first provider to go beyond issuing single course certificates. They launched their XSeries program, which consists of a certificate gained from completing a sequence of courses. Coursera and Udacity launched similar programs in 2014, which are called Specializations and Nanodegrees respectively. These “Big 3″ providers are working to establish brand new credentials using their own brands. The aim of these new credentials is to indicate some level of competence for high-demand skills. They charge for these credentials, of course; and though many doubt the value of these credentials, because their signaling value in the marketplace is still being established, quite a few students are choosing to pursue them. Because of this success, both Udacity and Coursera raised significant new funding in 2015, with the primary aim of creating more of these credentials. Currently there are 100+ Specializations, Nanodegrees, and XSeries credentials, most of which were created in 2015, and we can expect that number to more than double in 2016. The projections for 2017 and beyond could be exponential. We tracked this trend early, and this enabled us at Class Central to introduce a free credential exploration and rating service called Credentialing the Credentials. In 2015 there was a distinct focus on monetization by MOOC providers. This focus has led to an increase in the percentage of courses focusing on the field of technology and business.The percentage of Computer Science and Programming courses grew more than 10%. Due to this growth, we had to split the single “Computer Science and Programming” subject into two different subjects — Computer Science, and Programming. To learn more about how we categorize these courses, take a look at our online course taxonomy, which we open-sourced earlier this year. This growth in technical and business courses has led to a decrease in the humanities and social science courses, but overall there is still a healthy balance of technical and non-technical courses. Not much has changed in course distribution. The top three providers by number of courses are still Couresra, edX, and Canvas Network. 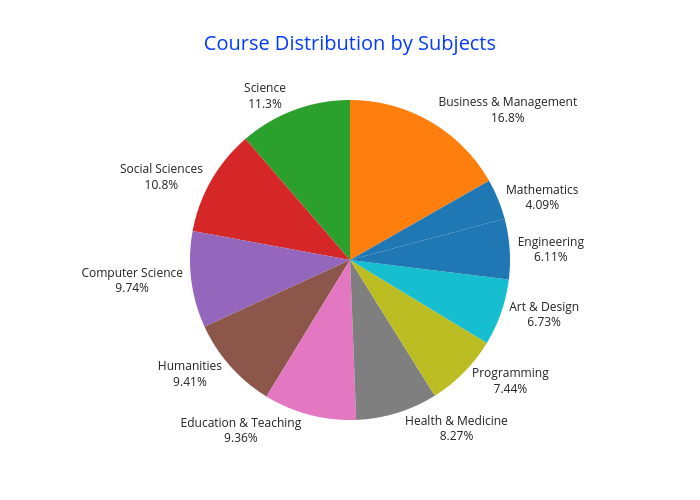 Like last year, Coursera still has the largest number of courses, and its course catalogue is twice as large as that of edX. Kadenze, a MOOC platform optimized for arts education, was the only new major MOOC provider to launch in 2015. It offers 30 courses from universities like Stanford, Otis, Princeton, and others. Some of its courses can also be taken for credit. 2. the fact that US-based providers like Coursera are now targeting international markets, and as such are creating courses in regional languages. After English, Spanish and French are the biggest languages in which courses are offered. Courses are currently being offered in 16 different languages, including Basque and Estonian. Kadenza is new to Moocs. Their fees are very high. They are not MOOCs. I expects comments from the course takers.